HCFoo's Tennis Blog – Tennis Celebrity Photos, News, Gossip and More! : Mirka spotted grocery shopping in Malaysia! While Roger Federer was at the meet-the-fans session, Esther who had just attended the tennis clinic conducted James Blake, walked towards the Mandarin Oriental hotel entrance. By the way Esther is a huge tennis fan (and also very tennis-savvy) whom I get to know through my blog. For the past one year we have been exchanging information and she helped me a lot in doing research and contacting media and organisers as well. There she bumped into Mirka. It wasn't easy to get a personal photo with Mirka but Esther was really lucky that day (*Esther just gave me the green light to post her photo with Mirka here). I walked back to Mandarin Oriental after Roger's meet-the-fans session and reunited with Esther. 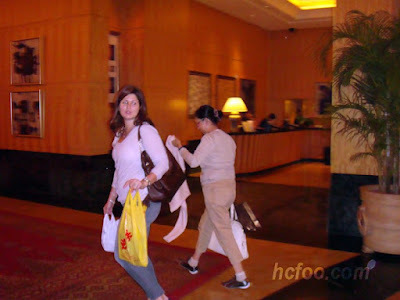 At the hotel lobby, we saw Mirka coming back from grocery shopping! Not sure what she bought though. The yellow plastic bag shows two chinese/japanese-looking characters. We asked for photos but she declined and kept saying, "Sorry, I don't take photos. Sorry!" Later in the evening, Esther, Siti (a tennis fan whom we met that day) and I walked back from Starbucks towards the hotel lobby hoping to catch the players before they head to the stadium. On the way, we saw Mirka again! She was right in front of us and we asked for photos again. She refused to take photos and repeated sorry countless times, "Sorry, I don't take photos. Sorry!" 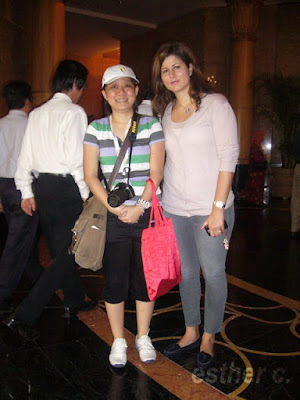 Then Mirka and her lady friend walked towards KLCC for shopping. It seems like nobody recognize Mirka. Now I must tell you how regretful I am for not following Mirka to the shopping mall. Then we saw her coming back to the hotel in a new black and white striped cardigan. She was late and Roger had to wait for her for awhile before they headed to the stadium for the exhibition match.